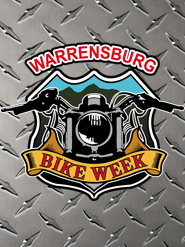 The Warrensburg Bike Week is a 10-day event that has something for everyone in the family. Great day rides through the Adirondack Park with views around every turn, to great local shops where you can find just about anything. Just ask a local, nothing is more than a few minutes away. Fantastic vendors, fantastic food, and a relaxing time to get away from the stresses of life. THE WARRENSBURG BIKE WEEK IS FREE TO ATTEND!! 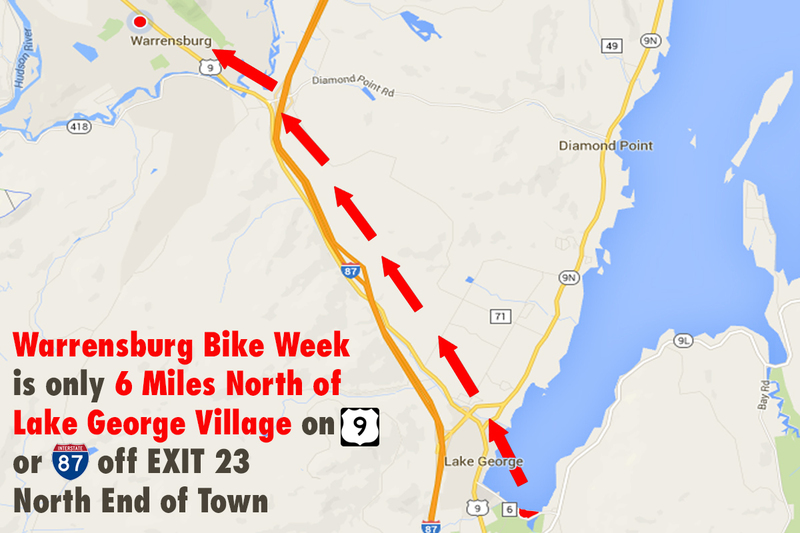 Warrensburg Bike Week event is located at 3957 Main Street in the Town of Warrensburg NY. Located in the Adirondack Mountains a few minutes northwest of Lake George NY on State Route 9. Readily accessible from Interstate Route 87 from the north and south at exit 23, from State Route 28 from the west and from State Route 9 from the north and south. GPS coordinates, N43* 30.060', W073* 46.963'. 745' elevation. The Town wide event, hosts a multitude of vendors that sell a wide range of items. Included in the list, items such as Metric Bike Parts and Accessories, Jewelry Repair, Standard Bike Parts and Accessories, Pretzels, LED Lighting, Sidecars, Leather Clothing, Lemonade, DOT and Decorative Helmets, Cheese Steaks, lots and lots of CHROME, Brand Name Heated Clothing, Stereo and Electronic Gadgets, Ice Cream, Custom made Stereo Earplugs, Beef Jerky, Pin Striping, Wing Bling, Custom Painting, Cheeseburgers, Free Coffee, Brand Name Tires, Pancake Breakfasts, Patches and Sewing Services, Southwestern Jewelry, Trike Conversions, Sunglasses and Goggles, Cell Phone Accessories and so much more. Want to know the best part? We call it "TOLL FREE SHOPPING". Ride on into Warrensburg and you won't find any parking meters. None, Nada, they don't exist. Park right on Main Street or off street at the Rob's Motorsports vendor site, on the north end of the Town. You can stroll up and down the main drag and shop and visit till your heart's content. "NO Entrance Fee". "No Wristbands to Buy". We want you to come to Warrensburg. Why would we charge you a fee to stop and visit and spend your money in our Town???? Remember that the Dealers and Vendors in the Town have also jumped thru a lot of Government Hoopla and Politics to be here to serve you. Just a friendly warning. Like the infamous 2008 mandatory roadside check on Interstate NYS-HSSP-2009.pdf With that said, DO NOT COME TO THIS AREA WITHOUT BEING STREET LEGAL. If your having problems with the images below it uses flash ( click here ) this may help. Rob's Motor Sports at 3957 Main St. would love to sell you a D.O.T. helmet. Rob's shop also sells trailers, trailer parts, hitch parts and trailer lighting. Although Bob Griffin and Son's repair shop is always hopping this time of year, if you get in a jam, they offer full service truck and car repair. Warrensburg Car Care at 3985 Main St. provides wrecker and flatbed towing and the service center will provide NYS motorcycle inspections. Call 518-623-3039 if needed. Being that Warrensburg is "The Queen Village" and "The Southern Entrance" to the Adirondack Park, the riding around here is at it's best. Easy day trips or just for a couple hours. You never need to go near Lake George, unless you choose to. Camping, Bed and Breakfasts and lodging, all of which are right here. Hiking, Fishing, Boating and Horseback Riding are all right here for you to enjoy.